Before starting the story about Leonid Osipovich Utyosov, it's necessary to mind all the difficulty of such a task: his personality is outstandingly many-sided - an actor, a singer, a conductor, an organizer, and, at last, a remarkable story-teller (as we could see in his TV broadcasts in 1970s). It's almost impossible to put the talk about Utyosov in narrow frames of a small article. We recommend those who want to know more about this artist to pay attention to his autobiographical books - "In Life with a Song" and "Thank You, Heart", written in a lirical-humoristic manner and including lots of facts and stories about Utyosov's life and art [1, 2]. Utyosov's talent was a synthetical one. Just such people like him, gifted in many fields, are the discoverers of new ways in art and science, as were Bach, Shostakovich and Ellington in music. And their ability to combine incompatible or, shorter, the art of synthesis, was the true secret of their artistic success. Of that kind was the synthesis of theatre, jazz and song in Utyosov's art. But to understand it better we should first say a few words about the nature of jazz. Jazz is opened for every influence - be it the impact of folk-lore, academic music, gesture and mimic, or fine art. Utyosov's "Tea-jazz" showed all the features of a theatrical performance. And theatre itself is a deep synthesis of literature, plastic and painting. Opera and operette add music to these arts. But Utyosov's orchestra, where musicians-instrumentalists became actors themselves, increasing the "mutual penetration" of arts, was the thing of a quite new kind, an experiment unseen before. But there could be no synthesis and such collective like "Tea-jazz" could not appear without its leader, who already gained great success as an actor in the age of 30. In 1923 he presented a show "From the Tragedy to the Trapeze" that demonstrated all the sides of Utyosov's actor's mastership in one evening. Such an emploi was, of course, closer to the eccentrical school, but one can't take away Utyosov's lyrical talents, too, as Kostya Potekhin from "The Merry Fellows" is both an eccentrical and a lyrical character. Among the prototypes and contemporaries Charlie Chaplin in America and Max Frisch in Germany should be named. In the late Twenties Utyosov heard the play of Jack Hylton and Ted Lewis bands, quite diverse by their artistic conception. He couldn't think of his life without jazz after that, but at the same time he had two "types" of jazz playing manner forever settled in his mind - "Hylton's type" - concert suits, serious conductor, staff, that differed a little from a philarmonical collective, and "Lewis's type". "Ted Lewis tried to turn every concert in a bright and exciting show. The musicians played dialogues and mimical scenes in a manner of professional actors" [3, p.39]. So, up to the end of the Fourties there were two parallel lines coexisting in the Utyosov's orchestra - instrumental and song-theatrical. Therefore we'll look upon his art in two aspects. At first Utyosov assembles an orchestra of ten musicians with staff similar to Lewis's band. After six-month rehearsals on March 8, 1929 the first programme, "Tea-jazz", was presented. It beared a strong resemblance with a typical Western revue, as there was no Soviet jazz repertoire yet. A new-born collective played American and European standard jazz schlagers. The end of 1929 saw a significant event: a group of musicians, who did not accept the theatralisation in jazz, left the band. Already the next orchestra's programme - "Jazz at the Turn" - included melodies created by Dunayevsky especially for Utyosov's "Tea-jazz" - jazz variations of popular classics and four "rhapsodies". 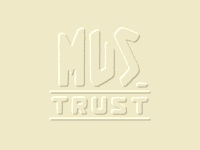 Many items of the first "Tea-jazz" programmes were recorded at Muztrust studio in 1932. Among them were three "rhapsodies", recitations to music, instrumental pieces, fantasies and variations of classical music. These records picture the face of Utyosov's collective of the early Thirties perfectly. Together with 1934 recordings, made already by Gramplasttrust, one should specially mark the examples of "city folk-lore" - "Little Lemons", "Gop So Smykom", "From the Odessa Prison", "By the Window". That was the beginning of jazz's turn to the song, firstly, of course, to the one known and sung by everybody. 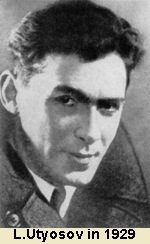 But the crucial point that changed Utyosov's approach to song in principle was the creation of the talkie "The Merry Fellows", where such famous Isaac Dunayevsky's works as "Heart" and "The Merry Fellows March" were played for the first time. From that moment the building up of synthesys of song and jazz begins - the feature that will characterize Utyosov's collective - the State Jazz Orchestra of the Russian Soviet Federative Socialist Republic. "Song jazz" - that was the term used by contemporary critics to define the band's genre. 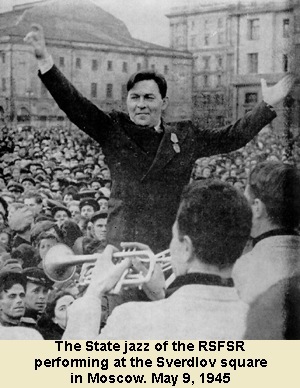 1937 marked the beginning of the RSFSR State Jazz regular recording sessions. Many of the songs put on a disk at the time were sung by permanent band's vocalist Edith Utyosova, the bandleader's daughter, that began to perform with the orchestra in 1934. Lyrical ("Mystery", "Portrait", "Ray of Hope", "Good Night"), patriotic ("Cossack's Song", "March of the Red Fleet", "Happy Stanitsa"), satyrical ("Butcher and Gester", "Shark", "Marquise"), people's ("Wide is the Sea", "Suliko"), were more than three fourths of Utyosov's orchestra repertoire. The band soon became the most popular jazz in the country. The staging of its shows retained much of its theatrical image, as it was in the early Thirties, but the collective's technique grew rapidly and soon met the highest level. Arrangements became more complicated and refined, and every, even unpretentious, song was turned into a chef d'oeuvre, were the art of arrangement of Leonid Diedirichs, Orest Kandat, Gustav Using, virtuous play of the orchestra's musicians, and Utyosov's talent of actor and conductor were combined. During the war years the orchestra continued its concert activity at the front line. The new programme "Hit the Enemy!" was created, and lots of new songs written by then young composers Nikita Bogoslovsky, Arkady Ostrovsky, Mark Fradkin were included into repertoire. Most of the evergreens of that heroic time as "Dark Night", "Baron von der Pschick", "Bombers" were first played by Utyosov's orchestra [2, p. 284]. The band's great concert at the Sverdlov square on May 9, 1945 marked the end of the war. Three years later the decree "About Muradeli's opera "The Great Friendship" appeared and the cruel "saxophones straightening" campaign was launched. The last jazz recording of the Utyosov's orchestra was made in 1947, and from that time the band becomes a variety-song collective and moves away from jazz. Utyosov still kept general artistic direction over the band, but, gradually leaving musical leadership, he preferred to sing with small groups. 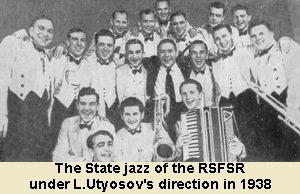 The first staff of the Utyosov's band included ten musicians, among which was Yakov Skomorovsky, the future founder of his own jazz orchestra. The only one recording features that period - "Good-Bye" foxtrot arranged by Ignatyev. Its artistic appearence is at the average level of the time, like the bands of Tsfasman and Landsberg, but the performing manner turns us back to the times of "eccentrical orchestras". The second staff of the orchestra left much more recordings made during 1932-1934. There are some outstanding instrumental ones - "Arabella" , where Utyosov represented his musicians, giving a solo to each of them, "Suite" (indeed not a suite at all), "Blues for Three" , an example of chamber music mastership of the band's soloists, "Kongo" , a precise copy of King Oliver's arrangement, as well as popular "Who's Afraid of the Big Bad Wolf" (recorded under the title "Mice"), and "Hawaiian Rumba" , a pot-pourri of well known rumbas. These ones were hardly one fifth of all recordings made. Only in 1938 Utyosov turned to put some jazz compositions without vocals on a shellac disk. These were the foxtrots "Temptation Rag" , "Loved by Everyone" , "Tonight" , "Fall In Love With Me" and "Duniade" , a fantasy based on Dunayevsky's melodies. 1939 brought a new series of instrumental recordings - Trumbauer's "Sun Spots" , "Caravan", "Solitude" and "Along The Waves" by Ellington, "Blues" by Ashkenazi and "Little House" by C. Porter. The latter shows the musicians' excellent knowledge of up-to-date jazz playing manner devices. After the war Utyosov's orchestra recorded only two disks of instrumental music without vocals: the first in 1945 - "Dolly" and "Always" , the second - "Blue Sky" and "Our Rhythm" in 1947. This one was the last record made before the band changed its name (to the State Variety Orchestra), staff and repertoire. 1. Utyosov L.O. In Life with a Song. Moscow, "Iskusstvo", 1961. 2. Utyosov L.O. Thank You, Heart. Moscow, VTO, 1976. 3. Batashov A.N. Soviet Jazz. A Historical Outline. Moscow, "Muzyka", 1972.